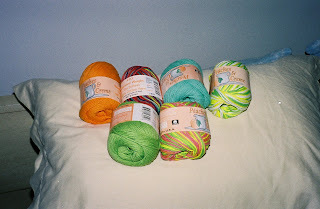 I think I mentioned a while back that I bought the Mason-Dixon yarn pack from Elmore-Pisgah, the manufacturers of Peaches 'n' Creme yarn. I used 4 of the balls to make bibs for my nephew. These 6 balls are what's left. I think they're destined to be dishrags. My old ones are falling apart. 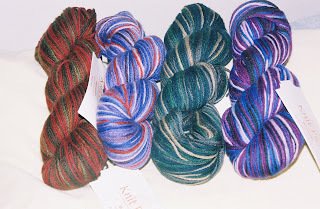 Here are some hanks of discontinued sock yarn from Knit Picks. I haven't yet decided what to do with them, but because it's 100% wool, some of it undoubtedly will be made into hats for the Afghans for Afghans project. And I guess I do need a new pair of hand-knit socks for myself. It may be April, but it's still cold here in the Midwest, and my feet get cold at night if I don't wear socks to bed. I do have a work in progress to show you. I'll post that separately.